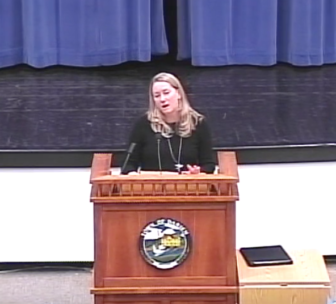 Diane Browne, owner of Browne & Co. in downtown Darien, gave several reasons for her opposition to the proposed ban on single-use plastic bags and regulations for paper bags and reusable bags when she spoke at the recent RTM public hearing on the matter. I am all for reducing waste and doing away with as much plastic as possible. Whenever possible we use paper. We have paper plates, paper straws, paper bags etc. Diane Browne, owner of Browne & Co., speaking at the Feb. 6 public hearing on banning single-use plastic checkout bags. That said, I think making what small businesses can and can not use is not the right choice. As a food establishment I already have so many things I have to comply with. It makes profitability very hard. The paper bags we currently use will not be in compliance and the paper company I use does not carry what would be. Most paper companies have large minimums, which would mean I would have to find a place to store them. We are already very tight on storage in our basement. All this said, by all means tell the grocery stores in town to do away with plastic bags. Encourage businesses to use paper, but to have paper police and handing out fines is a bit over the top. My name is Diane Browne, I’m the owner of Diane Browne & Co., 865 Post Road. I haven’t been here forever, but I’ve been here for 15 years, and we do not have plastic bags, and so that’s not the part of the ordinance that I have an issue with. We use paper bags. My concern is what kind of paper bags we are going to be allowed to use. As a store, we spend about $30,000 a year on paper bags. I’ve already talked to three of my purveyors, and nobody carries the kind of paper bags that are in this ordinance, and they said that if they do get them, if they can get them, it’s about a 15 percent increase, which is close to $5,000 a year. Having a small business is tough enough, and our profit margins get smaller and smaller every year, so $5,000 is not nothing, so I think that’s the only thing that, as a business owner, I wanted to say: This does affect us. Thank you. I wanted to let you know that we were able to source out a bag for our cafe and store that will make the BYO members happy. in the community feel like they were being heard. We did away with plastic straws and plates last year. I do believe getting rid of plastic bags is a good idea. I think encouraging people to do so, and use reusable bags is a good idea. to do business is not a good idea. Letting the business community use paper bags that can be recycled is a fair compromise. Having people in the community policing businesses is problematic. Please let me know if you have any questions.